Water & Sanitation Agency (WASA) LDA has been declared the latest positions like that Jobs NTS Latest 2019 Assistant director / SDO (BS-17), Assistant Director (P&D) / private housing scheme, Finance & Revenue and Administration (BS-17). 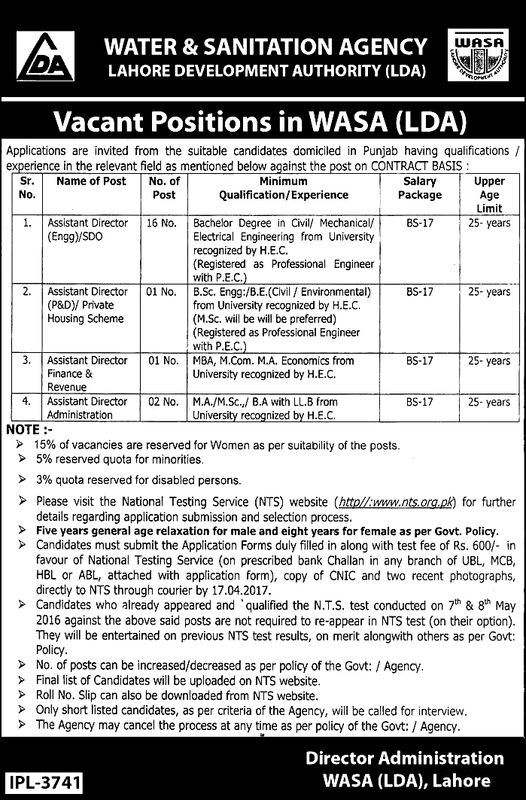 Applications are invited from all the eligible national candidates who have Punjab domicile on pure contract basis for the Assistant director position by the WASA (LDA). It’s very well career opportunity for all interested eligible candidates who will be fulfills complete eligibility criteria regarding qualification and experience. WASA has been giving complete hiring authority of Assistant director (BS-17) to the National Testing Service (NTS). If you want to get application form for Assistant Directors Water & Sanitation Agency Lahore Development Authority so you must be visit the official page of NTS link given below. According to these positions qualification and experience all the interested, eligible and motivated candidates must having the bachelor degree in civil / mechanical / electrical engineering diploma by the HEC recognized institute for the Assistant director / SDO while Master degree by the well university recognized HEC required for Finance & Revenue and Administration positions. According to the age limit so all these positions required same upper age limit 25 years. In these positions 15% quota fixed for women, 5% quota for minorities and only 3% quota reserved for the disabled candidates. All the interested eligible candidates will be deposit the test fee Rs.600/- in the favor of national testing service (NTS) in any online branch of United Bank Limited (UBL), MCB, Habib Bank Limited (HBL) and Allied Bank Limited (ABL). After download the application form by the NTS website so then attached with it all required educational certificates, two passport size photographs and CNIC copy must be reached to the WASA (LDA) Lahore head office through courier latest due date 17th April 2019.